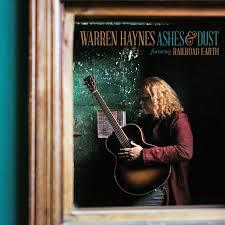 RockUnitedReviews: WARREN HAYNES: "Ashes & Dust"
Review by: Urban "Wally" Wallstrom Ashes & Dust, a darker side to the singer/songwriter music being more than hinted at as it's a completely different side to/of Warren Haynes (Allman Brothers, Gov't Mule). Dipped in melancholy, folk, and rootsy rock, the bittersweet and overall understated story of the album reek of Americana and the old US of A. Stories and songs that wouldn't normally fit his daytime project and band. Thus why Hayes decided to bring in the New Jersey based Americana act of Railroad Earth. Together they have created the whole she-bang from arrangements to acoustic guitars, viola/violin, banjo, and all of the instruments strongly connected to proper folk music. The basic starting point might just have been Country, Bob Dylan and The Band or even Neil Young, but the music is older than that. It dates back to Ireland and various other places around Europe. To be perfectly honest though. A couple of these tracks could/would easily fit The Allman Brothers and the slide-work of Haynes takes you on a journey through backside America. I'm especially fond of moodier tracks such as "New Year's Eve", while the honky-tonk inspired, "Stranded In Self-Pity", too much of the piano bar stuff in my humble opinion. You simply have to put up with the nonsense as far from everything that glitter is gold. A very solid effort and something to consider if you're into Americana and Haynes.